The stunning price increases in Greater Vancouver has impacted not only its surrounding regions, but outlier markets such as Bowen Island and the Sunshine Coast as first time buyers look for affordable housing and baby boomers cash out their home equity, buy similar homes at cheaper prices, and bank/invest the remaining profit. The result has been a chain-reaction of rising home prices throughout the lower mainland and lower coastal region. 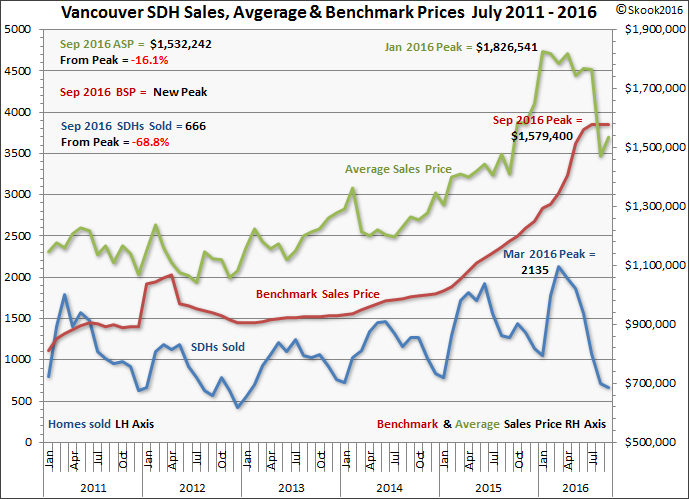 Because of the interest in and impact of its house prices, I’ve created a reference table and chart of the Greater Vancouver detached sales, and benchmark and average sale prices back to 2011 - the year, as Brian Ripley’s Greater Vancouver Chart shows, the current housing bubble was born. I will update both table and chart (scroll down) with the release of the REBGV monthly stats and you’re welcome to save both for your personal use; posting them to your own blog or website is acceptable only if you acknowledge this blog and give its web address. I’ve indicated with colour when key events that have impacted the Greater Vancouver detached benchmark price occurred. 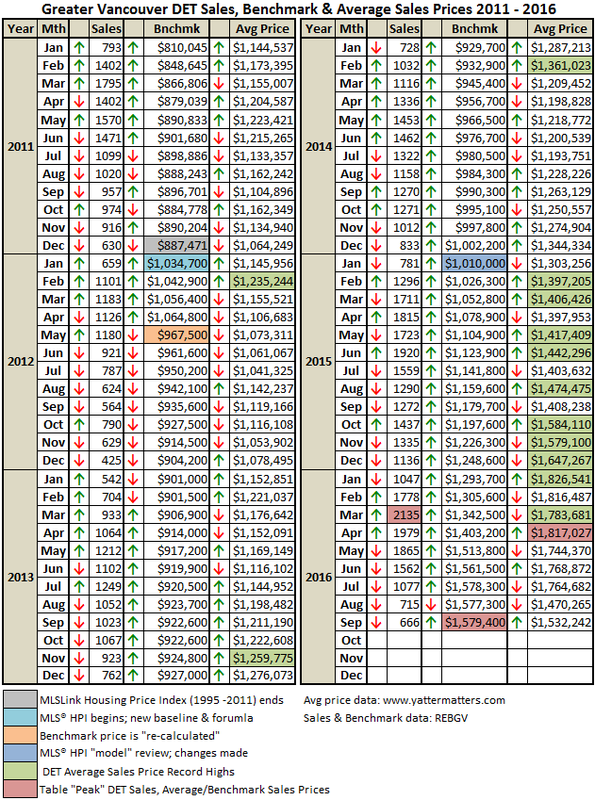 Here is how the Real Estate Board of Greater Vancouver announced those changes in its monthly statistics report. The new index replaces the MLSLink Housing Price Index, which had been used by Greater Vancouver and Fraser Valley REALTORS® since the mid-1990s. MLS® HPI statistics should not be compared with previous MLSLink HPI statistics(1). “The MLS® HPI is a national collaboration intended to give the public a more reliable and comprehensive tool to understand home price trends across the country,” [REBGV President] Setticasi said. The MLS® HPI benchmark price for all residential properties in Greater Vancouver currently sits at $660,600, up 5.7 per cent compared to January 2011 and down 0.1 per cent compared to December 2011. The MLS® HPI also tracks home prices across the Lower Mainland(2). The benchmark price for all residential properties in the Lower Mainland is $593,300, an increase of 5 per cent compared to January 2011. 2.) The Lower Mainland includes the areas serviced by both the Real Estate Board of Greater Vancouver and the Fraser Valley Real Estate Board, and is comprised of communities from Whistler to Abbotsford." You will notice that the Great Oracle compares everything on a year-over-year basis (which is still does today). 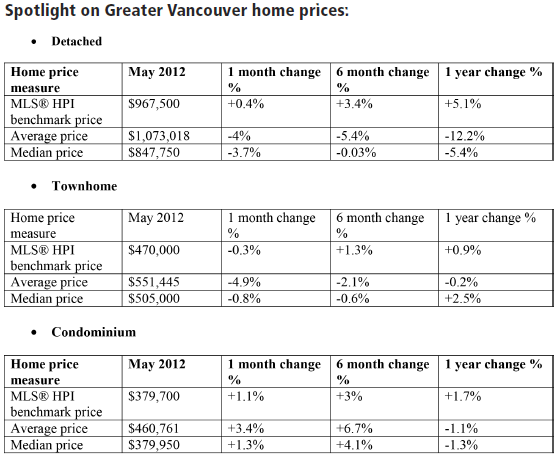 The Greater Vancouver detached benchmark price thus rose +11.3% when compared to January 2011. However, on a month-to-month basis, it jumped +16.6% and in the process established its first record high benchmark sales price. *Editor’s Note: Benchmark prices underwent a re-calculation this month in order to more accurately reflect trends measured by the MLS® Home Price Index. There were no changes to the calculation of index values. This re-calculation involved aggregating benchmark prices using the sales weighted approach for the reference period (i.e. January 2005) and thereafter linking movements in aggregate benchmark prices to their corresponding MLS® HPI. Bloody hell, eh. How many people within and without the REBGV do you think understood that? Well, one thing they would understand was what happened to the benchmark sales price as a result of this “re-calculation”. The detached benchmark fell back to below the $1million mark - a total drop of -9.1%. It wouldn’t scale $1million heights again until December 2014. Now, to assuage the psychological impact of this fall from such lofty levels (yes, I’m being sarcastic), The Board included the following table in the News Release. The last time the Great Oracle included a table or a chart in its News Release was back in 2009 and it has never done it again after May 2012. 1.) Areas covered by Real Estate Board of Greater Vancouver include: Whistler, Sunshine Coast, Squamish, West Vancouver, North Vancouver, Vancouver, Burnaby, New Westminster, Richmond, Port Moody, Port Coquitlam, Coquitlam, New Westminster, Pitt Meadows, Maple Ridge, and South Delta. There have been no further proclamations or “Editor’s Notes:” since. I have taken the table data and created the following chart. You can clearly see the impact of the introduction of the new MLS ® Home Price Index back in January 2012 and its subsequent “re-calculation”. “The MLSLink® Housing Price Index (HPI), established in 1995, is modeled on the Consumer Price Index (CPI) which measures the rate of price change for a basket of goods and services including food, clothing, shelter, and transportation. Instead of measuring goods and services, the HPI measures the change in the price of housing features. Thus, the HPI measures typical, pure price change (inflation or deflation). It was as a “Note:” at the bottom of the News Release.